Could Supreme Court Gambling Ruling Bolster Marijuana Rights? You Bet! An ally in the fight for states rights to enact marijuana legislation has come from an unlikely place. A landmark Supreme Court decision is primed to have a major effect on marijuana rights throughout the country, but the content of the case is not cannabis: It’s sports gambling. The recent decision in Murphy v. National Collegiate Athletic Association opposed a federal law that prohibited states from legalizing gambling on sports. At the heart of the lawsuit is a states’ rights issue, one that will set a precedent far beyond betting on games. The case began with Congress passing the Professional and Amateur Sports Protection Act in 1992, which made it illegal for states to allow sports gambling if they did not already have laws permitting the activity on the books, according to an article from The Hill. Years later, in 2011, New Jersey voters passed a ballot initiative to amend the state constitution and put in place sports gambling permissions and regulations, which sparked the lawsuit with NCAA and sports leagues. It was determined this was in violation of PASPA, so New Jersey legislators instead repealed the laws they had in place forbidding sports bets in casinos, hoping to create one legal avenue. Federal courts stuck down this action as well, which forced a Supreme Court decision on the matter. The Supreme Court, however, sided with New Jersey, stating that PAPSA violated anti-commandeering doctrine.How does this relate back to marijuana? 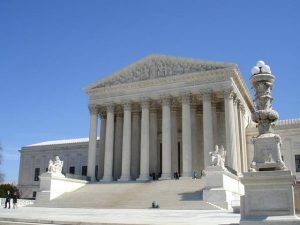 As our Los Angeles marijuana rights lawyers can explain, it all connects back to the 10th Amendment of the U.S. Constitution, which states, “The powers not delegated to the United States by the Constitution, nor prohibited by it to the States, are reserved to the States respectively, or to the people.” From this amendment, the Supreme Court created the anti-commandeering doctrine, which declares the federal government cannot force states to enact certain laws, nor can it force them to enforce federal laws. You see, the 10th Amendment on its own does lend quite a bit of authority to the states, but in conjunction with Article VI, Paragraph 2 (otherwise known as the Supremacy Clause), the Constitution still would consider federal law above state law in hierarchy. Without the anti-commandeering doctrine in place, the full extent of state autonomy and authority remains a gray area. By reaffirming the doctrine once again in this case, the court has bolstered states who choose not to align with federal law. This is particularly applicable to the 29 states that have legalized cannabis in the face of Controlled Substances Act, 21 U.S.C. Section 812, which labels marijuana a Schedule I narcotic. Not much changes for cannabis business owners, but it creates another layer of protection from hostile Attorney General Jeff Sessions, who has made his opinions on cannabis quite known as he has promised to do whatever he could to squash marijuana. Our attorneys know this is a victory, but there is still much work to be done. We can start by helping set up your marijuana business to be in compliance with state and local laws, while we keep a lookout on the national landscape for changing laws and relevant cases, like this one.